To lay the foundations of wisdom for life requires a certain kind of knowing, a knowing that comes from an education that teaches more than facts and skills. At the basis of the Cowan School® and Cowan Academy® educational models is a vision, the vision of Drs. Louise and Donald Cowan. 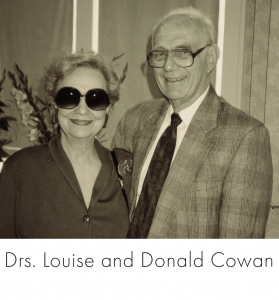 The Cowans’ distinctive understanding of liberal education was conceived while serving at the University of Dallas beginning in the 1950s. In 1980, they and four colleagues founded the Dallas Institute of Humanities and Culture, and they began to focus on a vision of liberal education for primary and secondary schooling. First, a word about liberal education. The word “liberal” gives many people pause, but the word in this context is not a political designation, like “Liberal” and “Conservative.” Rather, the concept of liberal education in the West reaches back to the 5th century B.C. to describe the education that was provided the democratic citizens of Athens, as opposed to the merely vocational training provided the servant class. The word itself comes from the Latin word liber (the root of our word “liberty”) which simply means “free one.” In other words, a liberal education is an education suited for a free person. A too narrow understanding of the word “liberal” is compounded by the phrase’s association with another currently underappreciated tradition, that of the “liberal arts.” The liberal arts are an important part of a liberal education but they are traditionally thought of in relation to specific academic subjects, particularly the humanities but not exclusive to the humanities. In this age in which people seem to consider the purpose of education, particularly public schooling, to be to train workers to keep the country competitive in a global economy, the liberal arts, and liberal education, in general, are mistakenly considered frivolous because neither has as its primary purpose an immediate, practical end. But Americans have always wrestled with the purpose of public schooling and so have waffled between these two poles. In Left Back: A Century of Battles Over School Reform, Diane Ravitch traces how the earliest debates about public schooling in the mid-nineteenth century centered on the tension between the more sophisticated model of liberal education, or an “academic curriculum,” and the vocational, or manual labor model of education inspired at that time by the second industrial revolution. And liberal education as the Cowans understand it is an education delivered in a “spirit of liberal learning,” an attitude that eschews mere practicality as its end, although the knowledge of certain facts and skills is important to the basic understanding of any subject matter. But if the goal of education is to help us “make our way to a recognition of the high, the noble, the magnanimous,” it must be more than mere information that we seek. It is here, in their theory of “poetry” and language that the Cowans move beyond a traditional conception of liberal education. Liberal education in the modern sense has always included the study of great literary works, but the Cowans insist that “poetry”—from poiesis, meaning “making”—provides access to the highest mode of knowing. In the liberal education tradition, philosophy typically enjoys the status of the most sophisticated discipline. But given to a kind of distillation as its mode of knowing, philosophy does not foster the breadth or imaginative elasticity that the Cowans ascribe to poetry, a capacity that is necessary to apprehend and understand the vagaries of human existence in all of its contradictory moments. “Poetry,” or any imaginative writing, makes its meaning through symbols and analogy, something standing for something else. It is, therefore, an intricate mode of understanding and more intricate, in some ways than the purely rational way of knowing whose goal is to distill a thing to its essential truth. Not only is the symbolic and analogical understanding provided by poetry a more multifaceted way of knowing; the form of poetry itself helps foster an even deeper capacity for understanding than even symbol allows. According to the Cowans, the proper study of the complex poetic form that binds together the disparate fragments of a great work of literary art helps cultivate in a student’s heart and mind a sensitivity for discerning subtle patterns and “coherences”9 in life, too. Far from being an escape from reality than, for the Cowans, properly studying great literature is the way in which one deepens one’s aptitude for language as well as the way by which one cultivates a capacity for better understanding the multidimensional features of the real world in both its visible and invisible manifestations. The Cowans’ philosophy of liberal education is further refined through Donald Cowan’s theory of the “three moments of learning” and Louise Cowan’s literary genre theory. Donald Cowan explains the complete action of learning as occurring in three moments—“grasping,” which he defines as the “innocent acceptance of, the dwelling with, an experience, its reality taken into the mind as a whole…before rationality sets in, before analysis has torn it apart”; “mapping,” which is the “structuring” stage of learning, a “device for presenting experience to the mind in a manner the mind can handle”; and “making,” the moment in which learning causes a “metamorphosis of the person,” transforming him or her “into something different” from what he or she was before. The “bulk of education is devoted to the middle term, structuring and systematizing,” he explains, even though the first and third terms, “apprehending and creating, are far more important to the complete action of learning.” The Cowan philosophy of teaching and learning helps educators understand the importance of the “grasping” and “making.” But because Donald Cowan insists on the distinctive “mappings” proper to each discipline, his “three moments of learning” theory also helps educators overcome another misguided notion of current “best practices” that seeks both to standardize methods of teaching across disciplines and also to measure achievement across disciplines using only one kind of metric. We have been “deaf” to the “tone of voice” of literary works for some time now. The revolutions of the 1960s, which included the introduction of deconstruction, swept through college and university campuses, and in that movement, the subjects of history and literature were most adversely affected. They became politicized and ultimately lost their authority as modes of knowledge. To gain access to the wisdom of great literary works, one must approach them in the proper manner, using the proper “mapping” to discern their action. Since 1984 in programs in the Dallas Institute’s Cowan Center for Education, Louise Cowan’s literary genre theory has shown educators the mapping appropriate to literary works and has thereby reinvested literature with its power to transform the human heart and mind. So it is in the convergence of these traditional and innovative theories that the Cowans’ philosophy of liberal education has transformed thousands of educators and millions of students and provides the undergirding for the Cowan School® and Cowan Academy models®. Currently, the kind of education described above is found almost exclusively only in the best private schools. In our public schools, especially, and in our urban public schools, in particular, there is a certain poverty of spirit that pervades the administration of the system. It is not a lack of spirit on the part of the students or the teachers or the administrators when they can help it. Rather, it seems to be a general insufficiency of vision—a lack of understanding for the full range of human development and possibilities—that has governed the decisions of those in control of American public school education increasingly in these last decades. Much is currently being made of the need to be practical in education, to teach “21st-century skills.” But these skills—typically identified as collaboration, digital literacy, critical thinking, and problem-solving—with the exception of “digital literacy,” are not exclusive to or even achievable by, in truth, a merely utilitarian or technical education. One needs content worthy of collaboration, critical thinking, and problem-solving. Without content, collaborations and discussions are merely physical or social activities. A focus on and a belief in the need for rigorous, substantive content is what distinguishes the best private schools. Guided by skilled and well-educated teachers, meaningful collaborations, critical thinking, and problem-solving come naturally in such a content-rich environment. What if a high-quality education such as this were available to all school children, even to every public school child? What if a liberal education were made available to every public school child? Until the 1960s, a liberal education was available in better American public schools, although it has never truly been available to all school children in America. But that can change. The Cowan Academy® and Cowan School® models are based on the belief that every child, especially in a democracy, can and should receive a liberal education. A liberal education is an education whose purpose is informed by a belief in meaning and truth, although often difficult to discern, and that truth and meaning can be better understood with a mind and heart cultivated with that end in mind. A whole person is the goal of liberal education, not merely a person as an economic indicator, the unfortunate outcome of an education focused on technical or practical applications alone. This sounds like the education for which we long when we talk about a ”well-rounded education,” the kind of education that parents often want for their children but also the kind of education that is crucial for a citizenry capable of living in and improving their own democracy. If, on the other hand, our purpose is to nurture unique individuals and citizens and to foster the nobler aspects of human nature, we need to give our children—all of our children—the opportunities provided by the breadth and depth of a liberal education. Based on the Cowan philosophy of education, a Louise and Donald Cowan School of Liberal Arts and Sciences® and a Louise and Donald Cowan Academy® are paradigms for liberal education in the public schools, educational models that highlight the quality and rigor of instruction in all subjects while they foster the human qualities necessary for one to thrive as an individual throughout life, including as a true member of society. Both the Cowan School® and the Cowan Academy®–like all of the Dallas Institute’s Cowan Center for Education programs—are shaped by the ideals from several intellectual traditions of liberal education. Since 1984 in Cowan Center programs, school teachers and administrators from all disciplines and grade levels have responded with joy to the poetic imagination. It is the joy of recognition, an awakening of an inner tutor that affirms the high, noble features of teaching and learning that educators know to be true but that they are too often forced to disregard in our day for utility’s sake. The Cowan Center’s philosophy of liberal education is not an agenda or a list of terms or standardized teaching methods. It is a spirit that awakens excellence and professional authority, and it generates an educational force as varied as both the individuals who comprise it and those who will be in their care. And since it is an attitude, one that affirms what educators know to be the highest purposes of an education, for decades now, Cowan Center alumni have applied it in their classrooms and schools. Every child could receive a high-quality education if our teachers and leaders were encouraged to remember who they are.